The Rasa is a hydrogen car that aims to radically change the way we think of personal transport; an affordable, hassle free, fun-to-drive eco car. 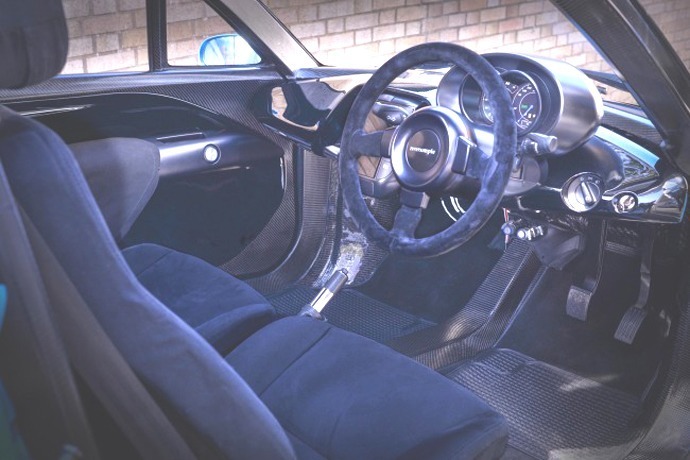 British company Riversimple aims to transform the way we use our cars by replacing outright ownership of diesel and petrol cars with hydrogen-powered vehicles you use like a mobile phone. Tabula Rasa means ‘clean slate’ in Latin. It’s an apt name for the new Riversimple car, a vehicle that redefines personal transport in our age of increasing population and diminishing natural resources. Every aspect of the Rasa has been created for simplicity, efficiency, lightness, strength, affordability, safety and sustainability. In some respects, the Rasa can be likened to the Citroen 2CV, the iconic workhorse of post-war France. The two cars share a purpose of design, top speed of 60 mph and a weight of around 580 kg, but the Rasa is very much a car for today. Its chassis is a monocoque made from very stiff carbon fibre composites and yet weighs less than 40kg. Weight distribution is even thanks to four electric motors, one in each wheel. The motors double up as brakes – recovering over 50% of kinetic energy when braking. Super-capacitors store this energy and provide most of the power for acceleration. The production prototype should do the equivalent of 250 mpg with a range of 300 miles. Emissions are zero at tailpipe and around 40 gCO2/km if the hydrogen comes from natural gas. The next stage in the development of the Rasa will see a fleet of twenty being used by members of the public for a year. Very few mobile phone users buy their handset upfront. Most of us spread the cost over the term of the contract. It’s a model that the makers of the Rasa aim to apply to motorists wanting to use a hydrogen car; they will retain ownership of the cars and sell mobility as a service. Rather than buying the hydrogen car outright or having to set up a hire purchase agreement, a simple pricing structure enables customers to pay a single monthly fee that covers everything – the car, the maintenance, the insurance, the fuel. The rationale is that customers have all the pleasure but none of the hassle of ownership. From the manufacturer’s perspective, it pays to make a car that lasts as long, and runs as well, as possible. How does a hydrogen car work? Hydrogen can be used as a fuel for electric cars thereby doing away with the need for a battery – the car does not have an engine in the conventional sense as it uses instead a fuel cell stack, a device that uses an electrochemical reaction between hydrogen and oxygen to produce electricity to power a motor. These so-called fuel cell vehicles can travel longer distances than electric vehicles that need to be re-charged directly from a mains supply. At an early stage, the Riversimple venture was backed by Sebastian Piech, a great-grandson of Ferdinand Porsche, who in 1898 worked on the Lohner Electric Chaise – one of the world’s earliest electric cars. The Lohner car had a top speed of 31 mph and a maximum range of 30 miles. Established over 25 years ago, and with over 5,000 recovery trucks on call 24/7, the ETA has a proven track record of providing efficient, reliable breakdown cover. We handpick only the best local mechanics and garages around Britain to send out if you break down. We believe this way of working is efficient, environmentally friendly and helps support local communities and economies, too. It’s one of the reasons we have been voted Britain’s most ethical insurance company.